Do you or someone you love have a Gluten allergy? I do not deal with this in myself or my family but know of several people who do and sometimes I feel so badly for the things that they have to eat. The diet of a gluten free person can seem bland and boring, filled with chalky-tasting foods and textures that leave you wanting something different. This is why some companies have made it their mission to make delicious gluten-free snacks that even the person on the strictest diet can enjoy. 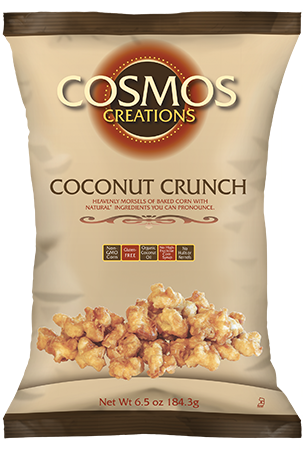 Cosmos Creations began as “Cosmos Caramel Corn” in 2004 in the kitchen of a culinary artisan. After quickly becoming a local sensation, it expanded from the kitchen to a 5,000 square foot facility, producing over a dozen varieties of the unique caramel treat and gaining distribution across the state of Oregon. Attending many home shows and other consumer events, providing samples to attendees, Cosmos Carmel Corn developed a loyal following. In July 2011, Cosmos was purchased by the Strasheim and Tiller families, under the name 4 Him Food Group. Since the purchase, the company has moved to a new production facility and the transition to Cosmos Creations began in September 2012 as the company sets up to expand on the national level. Cosmos’s flavor sensation is hard to describe, so maybe think “old-fashioned tasty treat with a twist”. It’s actually a puffed, baked corn and while there are other baked corn snacks available, Cosmos is the only one that is gluten free, trans fat free, non-GMO and made with natural ingredients you can pronounce. Other products have husks, shells or kernels that lodge between your teeth and drive you crazy. Cosmos however, practically melts in your mouth. I was very excited when I was offered the opportunity to try out these snacks from Cosmos Creations, but I wasn't sure what to expect as far as flavor was concerned . Boy, was I in for a treat! So, for this review I was sent a variety of flavors of Cosmos Creations Popped Corn. I was sent Salted Caramel, Caramel, Sea Salt & Butter, Coconut Crunch and Aged Cheddar & Cracked Pepper. The first thing I noticed is that this popped corn looks nothing like traditional popcorn. It looks like large pieces of puffed cereal and contains no hulls...which is great! Nothing to get stuck in my teeth. The one flavor that interested me the most was the Salted Caramel. I am very weak when it comes to resisting anything caramel and this flavor was NO exception! These pieces of corn are SO delectable...I had to keep myself from eating the entire bag in one sitting. (Although, it would have been super easy to do!) Just because I loved it though, didn't mean my family would. Now came the biggest test. I put several flavors into bowls and let my children each have a bowl. Cosmos Creations make for a VERY yummy snack after nap time or mid-morning. I find myself munching on these tasty little morsels throughout the day. Well, it really was no surprise that my little people LOVED Cosmos Creations! My littlest son, Isaac, sat at the dining room table and didn't move until his entire bowl was gone. He was so stinkin' cute too. Check out that "I LOVE these things!!!" grin. All three of my children loved the different flavors but I think my favorite, hands down, was the Salted Caramel. I think I have a bag left that is going to get hid so it doesn't get eaten by anyone. :) I will also mention that my husband thought these snacks were amazingly good as well and that is always a good thing! To find a store near you that carries Cosmos Creations, be sure to visit their Store Locator page. I am excited to know that these products are carried in many stores near me and will definitely be picking up some more bags in the near future. I would definitely recommend Cosmos Creations to anyone...whether you have a gluten allergy or not, these snacks are amazing and are a delicious, hunger-satisfying food for any time of the day! Be sure to visit Cosmos Creations on Facebook and also on Twitter...there is always something fun happening there! Check them out today. Disclaimer: I received no monetary compensation for this post. I did receive free Cosmos Creations products for review purposes. All quotes and stock photos are from the Cosmos Creations website and email. All thoughts and opinions are 100% mine. Don't Forget About Daylight Savings Time! !